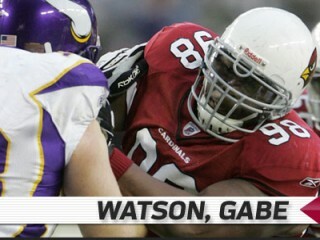 Gabe Watson is an American football defensive tackle who currently plays for the Arizona Cardinals. He was originally drafted by the Cardinals in the fourth round of the 2006 NFL Draft. He played college football at Michigan. 2009: For the second time in his career, played in all 16 regular season games; also played in both postseason contests … part of defense that held the 49ers to 21 yards on 25 carries in the season opener vs. SF (9/13); marked the third lowest rushing total in San Francisco’s history … helped hold the Texans to 45 yards rushing on 21 attempts and prevented Houston from scoring from the one-yard line on three consecutive plays with under two minutes to play vs. Hou (10/11) … registered two tackles and one tackle for loss vs. Sea (11/15) … led the defensive line with four tackles @ StL (11/22) … played in 50th career game @ Ten (11/29) … led the defensive line with a season-high seven tackles @ SF (12/14) … tied for the team lead among defensive linemen with three tackles and one tackle for loss vs. StL (12/27) … tied career-postseason-high with three tackles and along with fellow DT Darnell Dockett lined up in the offensive backfield to lead the way on a one-yard TD run by RB Tim Hightower to give Arizona a 7-0 lead in the Wild Card matchup vs. GB (1/10/10) … registered one tackle before leaving the Divisional Playoff game @ NO (1/16/10) midway through the fourth quarter with a knee injury. 2008: Played in 11 games during the regular season and started one of four postseason games after a knee injury suffered during the offseason caused him to miss the first four games of the regular season ... in his first game back from the knee injury recorded one tackle, one tackle for loss and forced his first career fumble on second career sack vs. Buf (10/5) ... registered one tackle vs. Dal (10/12) and helped limit the Cowboys (who entered the game averaging 138.8 rushing yards per game) to just 73 net yards rushing ... recorded two tackles and one forced fumble @ StL (11/2) ... registered career-high nine tackles including eight solo tackles and one tackle for loss @ NE (12/21) … inactive for the season finale vs. Sea (12/28) ... in first career playoff game registered three tackles vs. Atl (1/3/09); part of defense that held the Falcons, the second best rushing team in the NFL during the regular season with 152.7 yards per game average, to just 60 yards on 24 carries (2.5 avg.) ... made first postseason start of career in Super Bowl XLIII vs. Pit (2/1/09). 2007: Started all 16 games, recording a career-high 39 tackles … led all defensive linemen with a career-high eight tackles and six unassisted tackles to go with one QB pressure @ Bal (9/23) … recorded three total tackles and one unassisted tackle vs. Pit (9/30) while helping to hold Willie Parker, the NFL’s leading rusher heading into the game, to just 37 yards on 19 carries … for second straight week, led defensive linemen with four tackles @ Was (10/21); part of defense that held Washington to 160 total net yards … registered one tackle vs. Det (11/11) and helped hold Lions to minus-18 rushing yards, the lowest total in the modern era … recorded first pass defensed of career @ NO (12/16). 2006: Inactive for the first four games of the season … saw his first NFL action on the defensive line but did not record any statistics vs. KC (10/8) … made his first NFL start for the injured Kendrick Clancy on Monday Night Football, recording two tackles vs. Chi (10/16) … brought down Raiders QB Andrew Walter for his first career sack in only his second start while also collecting three tackles and two QB pressures @ Oak (10/22) … recovered the first fumble of his career in the first quarter vs. Sea (12/10) … recorded one tackle in each of the final three games. A talented run-stuffer at Michigan, finished his college career with 92 tackles, 14.5 stops behind the line of scrimmage, and five sacks … a consensus All-Big Ten Conference first-team choice … played in every game, starting seven contests at nose guard as a senior, recording a career-high 40 tackles (24 solos) with three sacks for minus 17 yards and 6.5 stops for losses of 25 yards … All-Big Ten Conference first-team choice by the league’s coaches as a junior … played in every game, starting the final 11 contests at nose guard … registered 37 tackles (25 solos) with two sacks. Full name Gabriel "Gabe" Pierre Kim Watson … attended Southfield (MI) High School … earned All-State honors at both offensive and defensive tackle … selected second-team All-American as an offensive lineman by USA Today and named first-team All-State offense by the Detroit Free Press … started and lettered four years on the varsity squad … also the team’s placekicker for two seasons … recorded 78 tackles and 10 sacks as a senior and the team ran 85 percent of their running plays behind him on offense … also participated in track and wrestling.